You are here: Home / Betting Odds / Special Events Betting Odds / Game of Thrones Betting: Who Will Rule Westeros? Game of Thrones betting odds have been released for the fans of the popular TV series who want to take a guess on the next rules of Westeros. 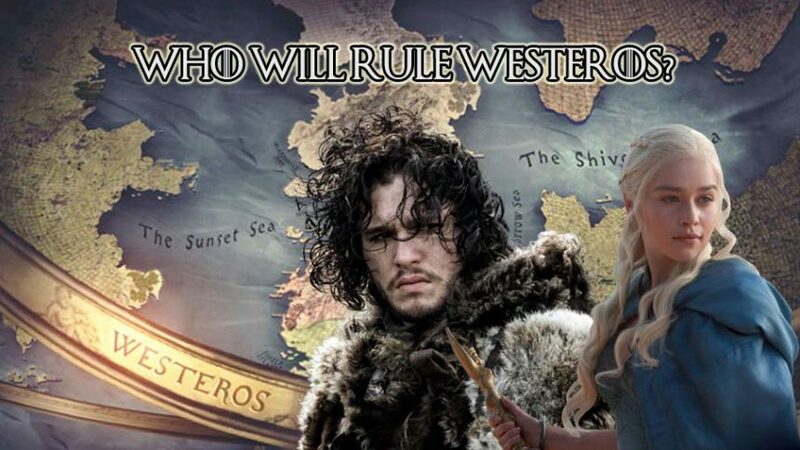 Let’s take a look at the most powerful candidates to win the battle to reign the four known continents in the known world of Game of Thrones! Game of Thrones betting options have been among the most creative and fun since the genesis of the massively popular TV series in 2011. The TV show is based on the fantasy novels of George R. R. Martin. Reading the books definitely helps to understand the story deeper and better. Nevertheless, the Game of Thrones betting options make more sense to the fans of the TV series which is currently in the 6th season. There are huge battles on the horizon which are expected to take place in the season 7. In such a situation, the vital question remains: Who will rule Westeros after the bloody battles? We’ll analyze the Game of Thrones betting odds and the most likely candidates to sit on the iron throne. But let’s have a look at the interesting Game of Thrones betting options offered by the European and United States online betting sites! How Will Jon Snow be Brought Back to Life? Some of the TV special betting odds have been really creative so far. Previously, Betsafe offered Game of Thrones betting odds on the possibility of Jon Snow’s revival during the season 6. You could have bet on Daenerys Targaryan’s arrival in Westeros, the character who appears first in the Season 6, and whether the Dothraki would fight for Daenerys Targaryan as their leader. Another interesting Game of Thrones betting option was “Is Eddard Stark alive?” in the season 6. Knowing that Sean Bean tends to die in most of the productions that he features, it was definitely a tricky subject to bet on. You probably know it already but, you could have bet on the first cause of death in the season 6. Greyscale was leading the way while beheading and killing with a sword followed it. Do you remember the cause of the first death in the season 6? Latest Game of Thrones Betting Option: Who Will Rule Westeros? It is time to figure out the name of the new ruler of Westeros. It is your chance to prove your Game of Thrones knowledge and make money out of it. Game of Thrones betting odds are coming! According to the popular UK betting site Paddy Power, Daenerys Targaryen is the strongest candidate to rules Westeros at the end of the 7th season. Her odds to win the bloody battle are 2.50. Jon Snow follows her with the odds 3.50 while Tyrion “the Imp” Lannister’s odds to rule one of the four known continents are 9.0. Sansa Stark’s odds to rule Westeros are scaled at 5.00. Check Paddy Power Review or simply click and bet at Paddy Power (bet £10, get £30 free bets). Another UK sportsbook, William Hill favors Daenerys Targaryen to rule Westeros as well. Her odds to climb to the iron throne are 2.75. Her strongest opponent is Jon Snow whose odds are scaled at 4.50. Sansa Stark, the legitimate child of Eddard Stark comes after Jon Snow with the odds 6.00 and Tyron Lannister is just behind her tail with the odds 7.00. The other likely candidates to rule Westeros are Petyr Baelish and Bran Stark; both have the odds 8.00. Check William Hill Review or head to William Hill (£25 free bet for new players) to bet on your favorite character. Betway jumps onto the bandwagon and favors Daenerys Targaryen to be the new ruler of Westeros at the end of the Season 7. Her Game of Thrones betting odds are 1.50. Jon Snow is the second most likely candidate to sit on the throne with the odds 3.20. The Night King and Sansa Stark are the other candidates to be the new rulers of the continent with the odds 6.00 and 6.50 respectively. You can still bet on the Imp who has the odds 8.00 just before Arya Stark (11.00) and Cersei Lannister (11.00). Check Betway Review or go to Betway to bet (get 100% max $30 welcome bonus) on the new ruler of Westeros now!